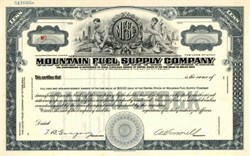 Beautifully engraved SPECIMEN certificate from the Mountain Fuel Supply Company. This historic document was printed by the Security Banknote Company and has an ornate border around it with a vignette of allegorical men with the company's logo. This item has the printed signatures of the Company’s President and Treasurer. Mountain Fuel Supply was founded in 1928 as a subsidiary of Western Public Service Corporation/ Ohio Oil Company until 1935 when it was consolidated under Mountain Fuel Supply Co. and then in 1984 it again was renamed as a subsidiary under a newly named holding company structure Questar Corporation. It is headquartered in Salt Lake City and is traded on the New York Stock Exchange, symbol STR. The company is divided into two entities; regulated and non-regulated. The regulated segment includes Questar Gas, a retail gas-distribution utility that serves over 700,000 customers in Utah and portions of Wyoming and Idaho, and Questar Pipeline with more than 3000 miles of pipelines in the Western US with a capacity of approximately 2.0 bcf/day.